Available in a variety of digital formats. Click on the one you prefer. OK, GOD, Now What - Whitney & Patty. Who Is Doing Your Thinking Your Subconscious. Transformation You Can Feel - Jesse's Story A homecoming veteran's success story..
Why did Donald write this book? Okay, God, Now What? by Donald C. Mann from Jim McCaslin on Vimeo. For the best book purchase package, see the Special Interview Offer below the Testimonials. 1.Those in some kind of adversity now. If you need breakthrough, this is for you! 2.Those who want to better their lives and leave nothing of God's goodness on the table of His loving kindness. 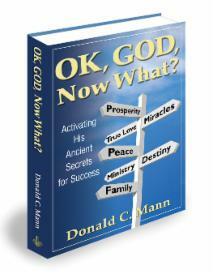 "In OK God, Now What?, Don Mann, a successful scientist, businessman, and long time Christian lay minister, reveals God’s core principles for uniting your heart on God and producing success in every part of life. By combining Biblical truth, modern discoveries on how the brain operates, and practical tools to renew your mind, OK God, Now What? opens the doors to help you fulfill your best dreams. "With the tools provided in OK, God, Now What? you can flourish in any economy or business environment, and in any situation to produce the best God has for you and yours. By using OK, God, Now What? as a workbook, in just 21, 40 and 90 days you will see dramatic results. 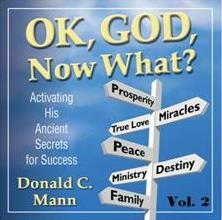 Mann's step-by-step process will show you how to get results using the Scriptures to build your faith and heart in God. By training your subconscious mind in God’s grace, truth and love, you will be able to work effectively with God to manifest your destiny in Him. So, what are you waiting for? Get this book and jump start your Christian dreams today!" Bob Hutchins, Buzz Plant Marketing. We developed this package for those who heard us on radio or saw us on TV, and now we are making this special offer available to those who purchase from this website. This offer is available nowhere else and is for this limited time now. Get OK, GOD, Now What? in softcover + Printed: The Top 10 Affirmation List + Bonus CD + Special Shipping for $34.99. That is all four items for one low price. This is easily a $60.00 value for savings of $25.00. Just the priority shipping & handling can be that much! All this for just $34.99. Be sure to include any interview radio or TV station call letters in your order. * BONUS Affirmations List: The single price includes your FREE Top 10 List of Awesome and Powerful, Bible Affirmations and Slogans in printed form to get you started renewing your mind and increasing your manifestation of God's great love plan and blessings for your life. With this BONUS list you will now have 10 of the most powerful slogan affirmations on the planet to jump start to a higher level, God’s best for you. They are the first Affirmation in OK, God, Now What broken into 10 bite size pieces, and are just a taste of the full set of 86 full length Affirmations in OK, God, Now What. It is the perfect starter set to get you going. To keep it handy all day, you can fold this FREE list for your purse or wallet. * BOOK: OK, GOD, Now What? in softcover-paperback format. The best faith building tool avialable. Where ancient Bible truth is explained by modern science so you can grow quicker and deeper in God and His goodness for you and yours. * BONUS CD: FREE Making It Work, Volume 1, is an encouraging and easy to understand message of how the Gospel can set you and your loved ones free into the love of God. Combined with OK, GOD, Now What this makes an awesome package of hope and strength. * BONUS SPECIAL SHIPPING: This offer price includes FREE special handling and shipping to get your package to you fast. Note: Pennsylvania sales tax not included in this special pricing. Note: Price appliles only to US destinations, other destination may incurr a surcharge. More about OK God Now What. Finally ... answers with lasting results and tools that work. OK, God, Now What? shows the Bible principles that are changing top sports athletes, sales, business and Christian leaders, and also ordinary people to godly success in every part of life. Gain peace of mind, clarity, purpose, health, wealth and a better life. Using OK, God, Now What? as a workbook, in just 21, 40 and 90 days you will see dramatic results. For the New Christian, get started right; for the mature Christian, get revelation, a new fire and peace like you've only dreamed of. You have committed to living life as Christ directed, but how do you go about making that happen? There is no magic wand. Being committed and just standing there doesn’t work. Neither does activity without heart change. What do you need to do? From the Bible itself Don answers the question: OK, God, Now What? OK, God, Now What? shows you the "hidden in plain sight" Bible principles that are changing the sports and executive worlds. God is no respecter of persons, do the right behaviors and you will get the right results. In OK, God, Now What? Don Mann shows in a step-by-step process how to get results using the Scriptures to build your faith and heart in God. By harmonizing God’s design of the body and mind with the solid behavioral guidelines found in the Bible, and modern science, you can grow into the person and believer you want to be. OK, God, Now What? illustrates and references these biblical principles, and in plain language, gives you a tool set of real steps to real change. Effective and consistent Bible faith comes from God's Word written on your heart. OK, God, Now What? shows you how to write His Word on your heart for effective faith results. Had enough of fads and quick fixes? Buy OK, God, Now What? and release God's abundance into your life. Rocket your steps on the path to your destiny. Jump start your Christian dreams. Get this book today! Search Inside OK, God, Now What? at Amazon.com Click here for link. Available in paperback, hardcover, eBook, audio book and durable versions. Donald C. Mann met Jesus in the dynamic 70’s in God’s power. Don saw how Bible principles helped him grow businesses hundreds of millions of dollars and disciple new believers to more power with God and love in their lives. Ever practical, with over 35 years of ministry, he gives biblical tools that work. Don is currently president of RiteMann, a business growth consultancy, and leads Covenant Peace Ministries to demonstrate the dynamic power of God in supernatural ministry. This is the book that shows you how to build the secret ingredient of power with God, faith. Regular Retail Price: $24.99 in Softcover. Price does not included handling, shipping and PA state taxes. In OK God, Now What?, Don Mann, a successful scientist, businessman, and long time Christian lay minister, reveals God’s core principles for uniting your heart on God and producing success in every part of life. By combining Bible truth, modern discoveries on how the brain operates, and practical tools to renew your mind, OK God, Now What? opens the doors to help you fulfill your best dreams. In this life-changing book, Don explains the long hidden biblical technology for renewing the mind and how recent medical psychological and neurological discovers confirm and magnify these powerful truths. Then Don gives practical steps on how to renew your mind to harness the unlimited potential of you and God working together to bring His Kingdom to Earth in order to achieve exactly what your inner man desires. With these tools in OK, God, Now What? you can flourish in any economy or business environment, and in any situation to produce the best God has for you and yours. Whether that is yourself, your family, your parenting, your children, your church, your neighborhood, your vocations and ministries, or your company, God has wonderful answers and blessing, and Don shows you how to get and enjoy them. With OK, God, Now What? build the neurons that to lead to love, prosperity and divine health. Provide the right pathways in neural synapses that release the right thinking that leads to the power of God in your life. Learn how to do Godly behavior modification that lasts. Change your behavior by changing your thinking by using the God-given tools of adult heart education to transform your life. Have you been waiting for the right impartation? The right anointing? That special word? That special gifting? You already have them if you are born again in Christ. What has been missing is you making the grace and truth of Jesus Christ a reality in your heart, the unconscious or subconscious mind. Discover this wonderful truth, if you have been waiting on God to move, He has been waiting on you. By using OK, God, Now What? for training your subconscious mind in God’s grace, truth and love, you can now work effectively with God to manifest your destiny in Him. Create predictable transformation in your life. From developing the skill and honing the approaches, to laying the foundation and adopting the right attitudes that shape your destiny, OK God, Now What? shows you how to use God’s ancient secrets to producing His goodness in the earth, and for you to fulfill your purpose in life. OK, God, Now What? gives you the biblical truth, the biology of the human nervous system, and a step-by-step process to make your heart the powerful tool of God to release His goodness into every part of life. OK, God, Now What? gives a step-by-step guide and instructions on how to enter God's prosperity, true love, miracles, peace, ministry, destiny, family, faith, endurance, rise like an eagle in adversity and tough times, victory and success in every part of life. Do it God's way for His best results. The Affirmations in OK, God, Now What? are designed for daily straight through use or in smaller sections as inspirational devotions. Yes, OK, God, Now What? does describe ancient techniques and spiritual disciplines for Scripture centered spirituality that are working in sports, business and all parts of life to the glory of Father God by Jesus Christ our Lord. OK, God, Now What? is so rich with scripture that the entire book is a powerful devotional or Bible study guide. With so many Bible verses, each chapter is a powerful resource. This makes this book an awesome value just for study. It helps us get the message out if you buy from us. Otherwise, our books in the POWER TRILOGY are available wherever fine books are sold. If they do not have it in stock, they will be able to order it for you. "OK, GOD, Now What" is available in Digital formats, including: ePub, Nook, Kindle, Nook, pdf, iBook, etc. For specific digital formats, see your favorite outlet. Want to grow as you go? Get the OK, God, Now What? audio book. Yes, I want the audiobooks for OK God, Now What? as read by the author. Unabridged. The entire audio book is available in two volumes, and each volume is available in CD or MP3 Disc format. Print + Audio: Get the softcover-paperback version of OK, GOD, Now What? plus both volumes of the audio books in one cost saving package. A $94.97 value, you save $10.00 and get the entire bundle for $84.97! Audio Book: Get both audio book volumes of OK, GOD, Now What? on one cost saving package. A $69.98 value, you save $5.00 and get the entire bundle for $64.98! Get copies for your friends, give as gifts, use in seminars, prayer groups and classes. For other products, such as the audio books, please Contact Us. 1. Is this a new method? For clarity, the method is in the Scriptures, the understanding of how the biblical methods work has been the fruit of modern science. My hope is that as people understand the biology they will start to obey the scriptures. Once you see the scriptures I think you will agree that it is rather obvious that we, the Body of Christ, have not obeyed them. At least in the part of the Church I am aware of. Why delay? Get your copy today. Note: Pennsylvania state tax applies to all orders for those state residents. 1. Click the "Add to Cart" button for the book or item you want. 2. You will be taken to the shopping cart contents menu. 3. After you finish shopping, and the cart contents are correct, then you will fill in you shipping and payment information in "Check-Out." 4. Also please indicate how you heard about us or if you are a current member in the "Other" information area below the credit card section on the "Check-Out" form. 5. Find your country in the drop down menu that says "Select Country." If you live in the United States, for instance, select United States. If you live in Puerto Rico, select Puerto Rico. If South Africa, click that. Brazil, select Brazil. If you live in the Philippines, select Philippines. 6. Skip the state drop down menu if you don't live in the States or Canada. If you live in the States, select the state. If you live in Canada, select the province. 7. Type in the postal or zip code. South Africa is a 4 digit code. Others have 5 or 6 digits. 8. You may see a shipping charge as you first checkout, but this is not the final shipping charge. Only after you have finished all your contact information will the proper shipping charge be able to be calculated. If the only thing you are getting is a free item, the shipping charge will then go to "$0.00." 9. If there is a shipping charge, then you can select which shipping method you prefer and the final shipping charge will be calculated based on your address and chosen method, and added to you total. 10. If you have any special delivery instruction, go to the block at the bottom of the form. If your request creates any additional charges, we will contact by email. 11. Follow ALL directions carefully. To use a credit card, use the left side "Option." Fill out ALL information and complete the order. Receipt of confirmation will be sent to your email address. It's that simple. IMPORTANT: If the order goes through, you will receive an email receipt. If you don't receive an email receipt, it means the order wasn't completed or there was some data error. Please confirm your email address. So re-do. All returns must be pre-authorized by e-mail and you will then be given the returns processing center address, which is different than the address listed above. Returns that have not been pre-authorized will not receive credit. All materials must be returned in their original condition to receive credit. Credit for missing or damaged components will be deducted according to the values posted on this website at the time the credit is issued. Returns and return requests received more than thirty days from the original date of purchase will not be authorized or receive credit. All returns are subject to a ten percent restocking tariff and a deduction for shipping costs. Our books are written with the attitude of: "I wish I had read this book when I was new in Christ, what a difference it would have made." We've seen God do lots of wonderful things, and I want you to experience Him in the same, and even greater ways. For the best package, see the Special Interview Offer above.